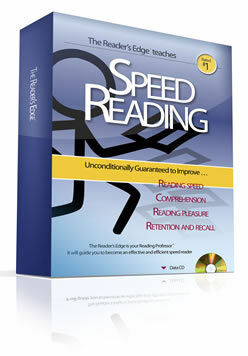 The Reader’s Edge Pro – Speed Reading Software – Discount! Learn to read faster with improved comprehension. How can you double or triple your reading speed while improving comprehension? The Reader’s Edge is a self-paced software program that uses computer generated visual exercises to help you unlearn the habits of slow readers, and learn the habits and skills of rapid readers. Reading™. Fluent Readers read better and faster, with improved comprehension and recall . . . and get better grades. Use The Reader’s Edge just 15 minutes, every other day, for a few weeks and you will be amazed at how quickly your reading speed and comprehension will improve. Effective reading skills are needed in today’s information-based society that ultimately judges individuals on their ability to read. Unfortunately, proper reading skills are not being taught in today’s reading curriculum. The Reader’s Edge teaches enhanced reading skills to individuals of all ages. The first step in becoming a Fluent Reader is to differentiate between “less efficient” and “more efficient” reading skills. When learning to read, we are taught to read out loud, or vocalize each word, as we read. Then, as we get older, we are expected to read silently, without any formal training… this is where The Reader’s Edge comes in. It helps you easily and naturally develop the skills of efficient readers. Designed for both Adults and Children ages 5 and up. Customizes training for each user. The Reader’s Edge tracks your progress and automatically increases difficulty at the optimum rate for you. Creates a level of confidence, within minutes, that you have the capability to learn how to read better. Focuses on expanding your peripheral vision. Teaches you how to see and read groups of words (with a single eye-fixation) at 3-to-6 times your current reading rates. Creates phrases (units of meaning) in the eye exercises from our exclusive Prime Words List. Demonstrates the importance of phrase familiarity to convey units of meaning. You have complete control. You decide the number of characters, words, or phrases that will be displayed in the exercises, as well as the flash speed at which they will be presented. How will increased reading speed and comprehension benefit me? What is the difference between inefficient and efficient readers? What makes The Reader’s Edge so unique? Most people read at an average rate of 250 words per minute. Just a 100 words per minute increase, without considering other factors, would mean that you would read the same amount of material you currently read, in 60% of the time you now spend – an improvement of 40%… this increase is the equivalent of about 12 extra 200,000 word books a year!!! See and read one word at a time. Eyes fixate (stop) on each word. Vocalize (subliminally or lip) each word read. Vocalize while reading, limiting reading speed to 160-220 words/minute, the rate at which we speak. Are unable to derive the meaning of new words from the context…resulting in poor comprehension. See and read in groups of words. Do not vocalize… there is no limit to reading speed. Your brain is capable of handling thousands of words per minute. Derive meanings of words from context, gaining better comprehension and dispelling the popular myth that one must read slowly to have good comprehension. Spend 15 minutes every other day for at least two weeks doing the Reader’s Edge exercises and you will double your reading speed. It’s that easy. Imagine in two weeks being able to read twice as fast as you currently do with improved comprehension and recall.